Any person who is responsible for earning their own income is now an Incomepreneur in the new cyber economy. Click On My Current Video Testimonials From 3 IncomePreneurs Who Have Become My Friends in Commerce. Your Current Reviews Can Now Become Your Best "TV Commercials!" Incomepreneurs.com is the income wellness through the fusion of person to person communication fuzed with zoom video networking program. A company developed by Mike Hayes [The NetworKing]. 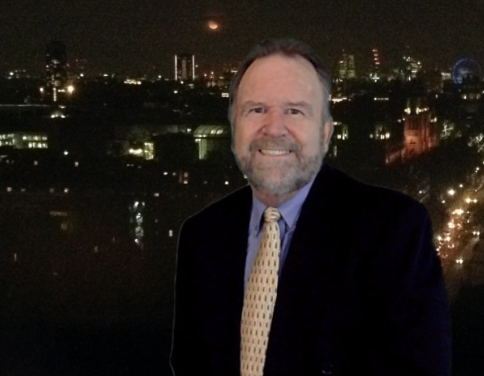 Mike is a veteran of NBC in NY, CNN in LA, direct response advertising agency owner spanning a 30+ year career as a broadcasting, publicity and advertising professional. Increase your clients, customers and income by 20% to 40% simply by adding the simple new skill set that companies and consumers demand. Click Above: And Learn How I Collaborate with My Dream Team Partner Ronald Couming So You Can Get Top Search Engine Ranking BEFORE You Pay! ★ Videos bring you more clients. ★ Video communication is 90% more effective than pictures and words alone. What can Zoom video communication do for me? ★ Don't get left behind, learn to make your own videos. ★ The teams have fun together and bond over mutual goals. ★ As we go through the networking communication and zoom video conferencing project the income wellness confidence building energizes the experience. ★ Everyone has a great time. skills to get more clients the cyber economy? We organize boot camps as mentoring or competitions and sharing between teams, departments, and campuses that will enrich your moral and your income wellness. your employee development yearly campaigns and themes. ★ Our programs are designed to meet the needs of your company. ★ We supply all materials and can set up at you site or offsite. ★ Session #1 - what’s your story (what you do and why)? 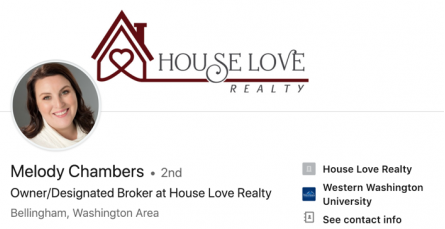 We’ll hash it out together and find the one that best suits you and will get you more clients. ★ Session #2-Session #2 - How to ask people for testimonials (or have us do it for you!). ★ Session #3 - How to prepare (a little) for being on camera. We’ll walk you and your friends through so you all look and feel your best. ★ Session #5 - Take your testimonials to the world! We’ll work with you to get your ideal plan to get your testimonials out to the world. Take the first steps with our guidance and have a plan in place for the rest. ★ Are your sales up - like Cyber Monday Selling - which grew nearly 20% this year over last according to Adobe Analytics? 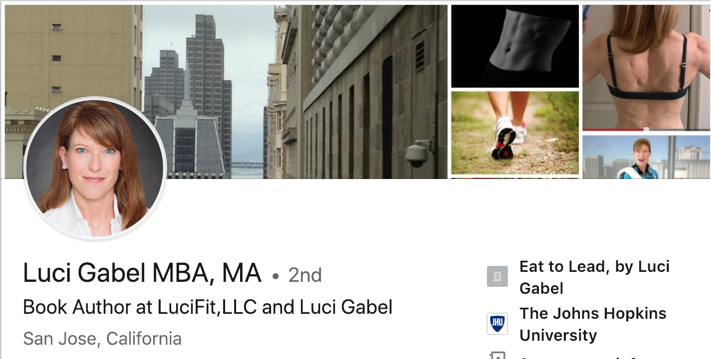 ★ Individual Bootcamps or Company Projects can be done by individuals or groups, be competitive, or non-competitive, single session or a series of classes. ★ We can incorporate your company materials and accommodate the needs, interests, and goals of your company. ★ The results will be worthy of posting on your site, YouTube, Linkedin, Facebook, instaGram and more and call also be emailed to any highly targeted audience. ★ The stress hormone Cortisol drops immediately and the feel-good hormone Dopamine rises which boots drive, focus, and concentration. The armor is coming off. ★ Today work is mostly left brain activity. Communication helps balance left and right. ★ Teleprompter communication sessions increate collaborations, motivation, and provide wellness benefits all at once. Everyone walks away smiling. 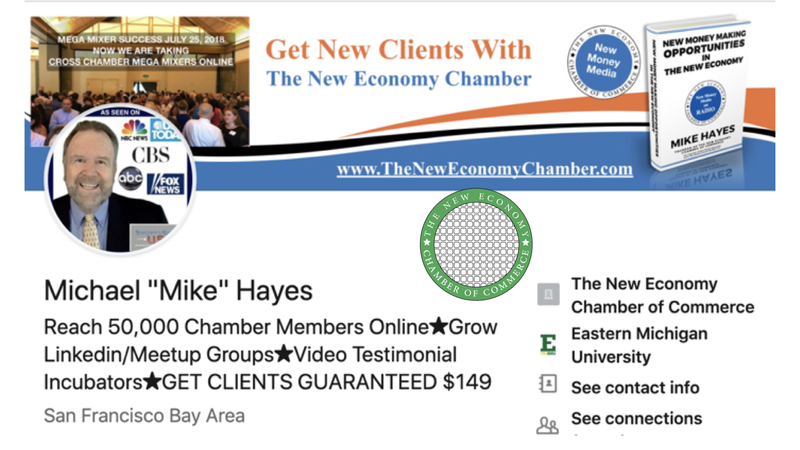 “If you’re looking for a mentor about how to get publicity and become better known, there is no better person than Mike Hayes." "Mike Hayes, is one of the most creative ingenious people that I have ever met." 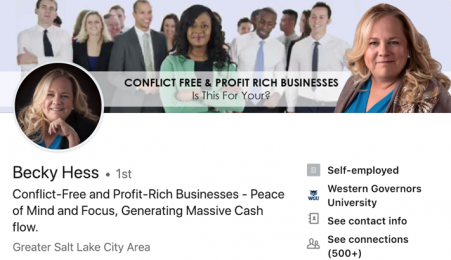 Conflict-Free and Profit-Rich Businesses - Peace of Mind and Focus, Generating Massive Cash flow. ★ Hear Three Off Camera Testimonials demonstration for your clients who don't wish to appear on video. 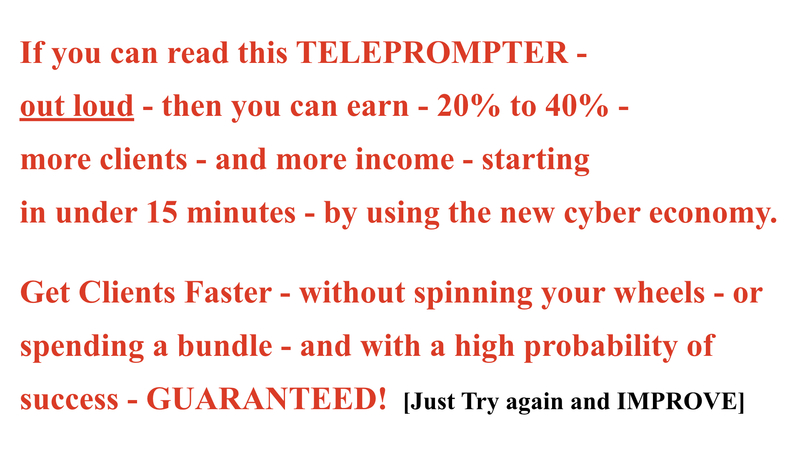 ★ Icebreakers like team leaders practicing teleprompter copy as you see below. ★ An impressive product of teamwork, planning, and openness will result. LISTEN IN ON HOW this program was developed in a LIVE Group Incubator! 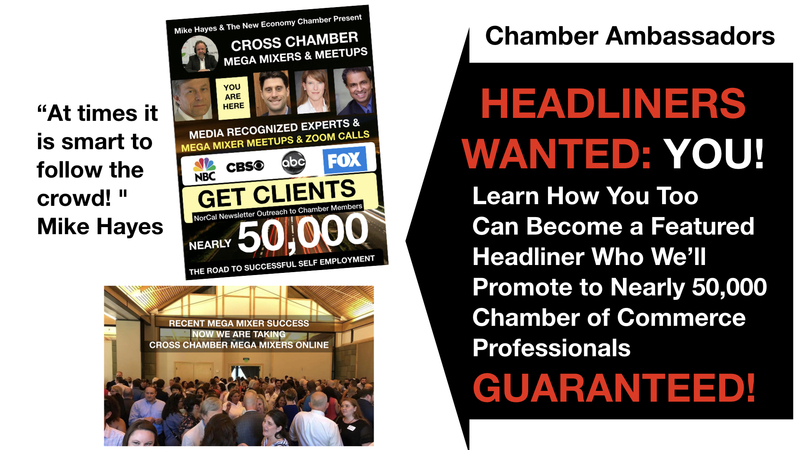 CROSS CHAMBER MIXERS & BUSINESS EXPOS ARE NOW LIVE ONLINE! Connect In-Person Plus Online To Accelerate Results. Connect right here and right now, with small or even HUGE audiences of people actively seeking to connect with you, whether in-person LIVE online or digital direct commerce, because while amateurs network; professionals connect. Connect with our Dream Team of specialists in building huge audiences for small business owners, entrepreneurs, professionals, speakers, authors, health experts, and businesses of all sizes. Our Calendar of Events may appear simple because only our online LIVE connection meetings can do our Dream Team justice and allow you to share in a cornucopia of options and peer-to-peer mentoring and connecting and need to be experienced. Whether you prefer in-person meetings, LinkedIn, FaceBook, YouTube, Google, Meetup, webinars, email, local networking, or something else, our LIVE online meetings and in-person meetings will help you get more clients. Join our free weekly Thursday morning networking meetings, webinars, and in-person Meetups to learn more. You can’t tell a Calendar of Events by its cover; it's where it CONNECTS you that counts. I've launched many successful national radio shows including Sports Byline USA, Weekend Sports on NBC Radio, Peabody Award Winning documentaries and now, our latest show is New Money Radio. The "job" market is changing. 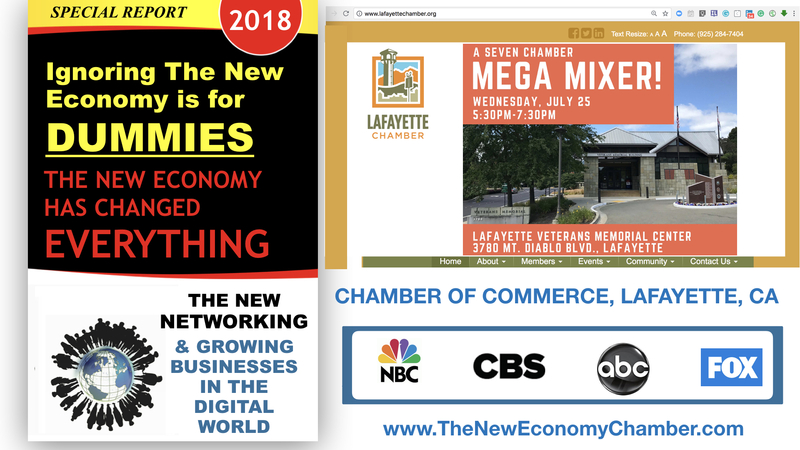 Wonder What The New Economy Chamber of Commerce LOOKS Like? LIVE LIKE THIS, OR BOTH!